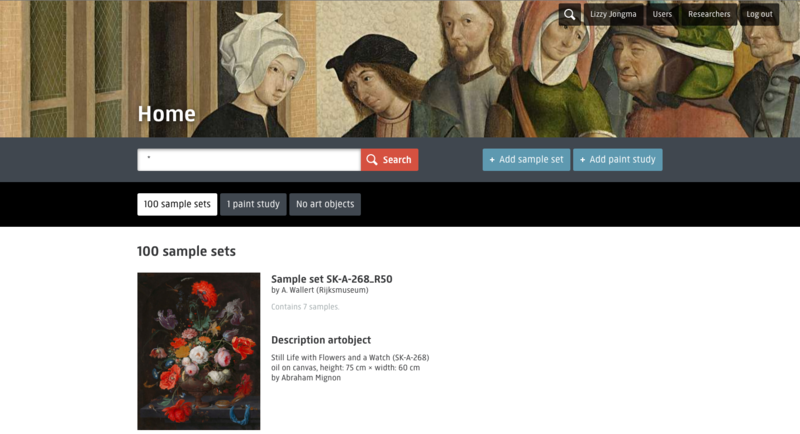 The Rijksmuseum recently developed a web based paint sample database; one of the first in it’s kind in the world. Paint samples have been collected and analyzed in the conservation department of the museum for decades. Paint samples are studied to learn more about layers in paintings, materials used, dating of paintings etcetera. Paint samples are a rich resource for in depth analysis of paintings. For researchers, conservators and curators inside and outside the museum. The museum aims to digitize all paint sample documentation that is currently available on paper. 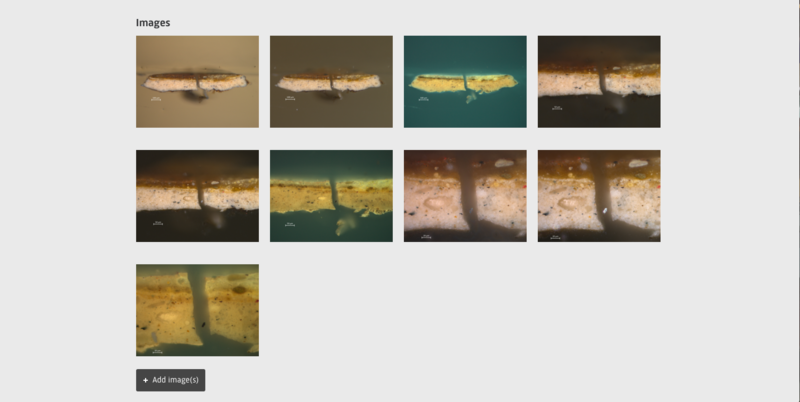 And all existing embedded paint samples will be digitally photographed. 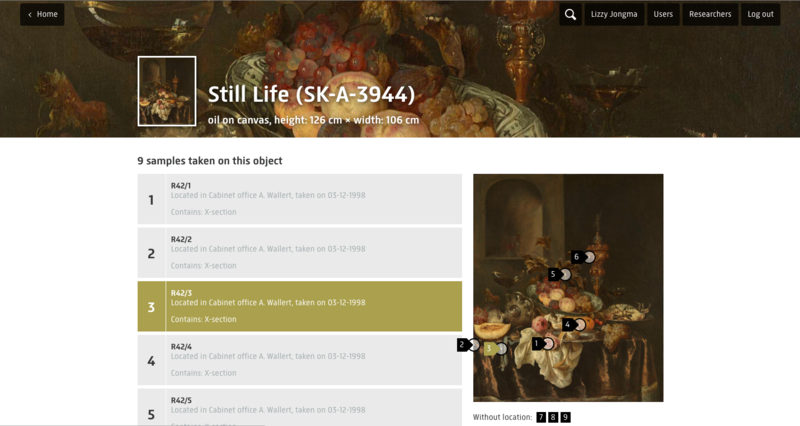 With the paint sample database project the Rijksmuseum saw an opportunity to color accurately photograph the museums’ collection of cross-sections: this is the first time a museum color accurately digitizes microscopic images. A user-friendly system is developed to gain color accurate photographs of cross-sections, while maintaining the scientific integrity of the images. The embedded cross-sections are photographed under a research microscope with reflected light (bright field with crossed polarizing filters, dark field and ultraviolet fluorescence) at between 25x and 1000x magnification. The influence on the color quality of the images of the objective (e.g. magnification), exposure time and the type of reference color chart is taken into account. It is important to make use of color accurate images of cross-sections during research to improve consistency and to gain objective scientific results. The color of the image of a cross-section is influenced by several factors, like the source of light, filters, and the software of the microscope, e.g. the white balance. Color accurate photography makes it possible to compare pictures of different cross-sections even taken with different microscopes with different types of lamps. The standards for digital recording in the paint sample project will result in a system that can be easily adopted by other institution. 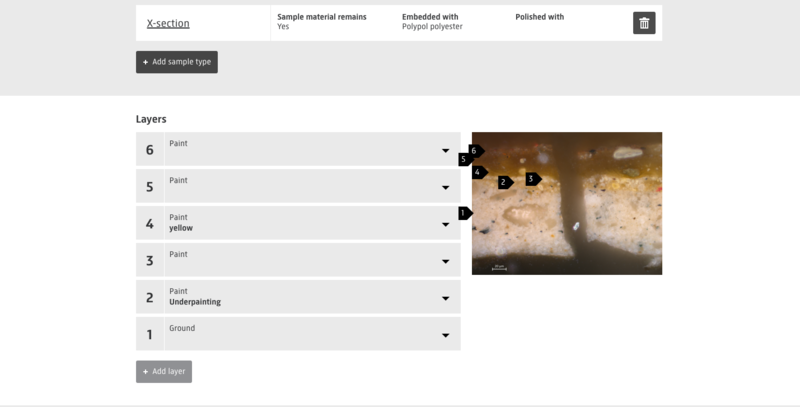 The paint sample database will, from the beginning of June, be freely accessible for anyone interested in our scientific data: the user friendly interface shows where paint samples were taken, and what they look like under a microscope. 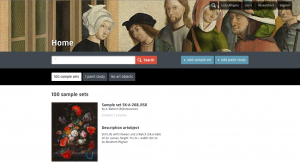 All microscopic and research data will be available and downloadable (under the same free licenses that the Rijksmuseum uses on its website). In the next section the microscopic image of a paint sample is described. All different paint layers are marked and described. Other microscopic images are added to the database. These are dark field images and zoomed in images. To search all objects enter * in the search field.